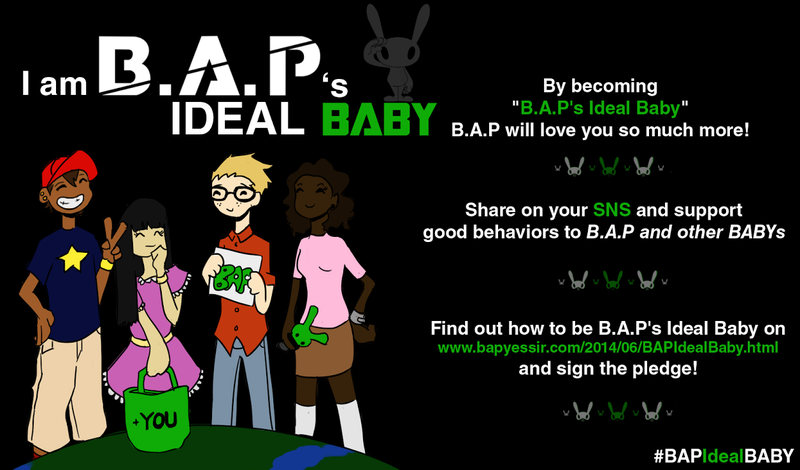 BYS: Friendly Reminder on How to be #BAPIdealBABY! Friendly Reminder on How to be #BAPIdealBABY! We have the conviction that it’s possible to convert many fans into mannered and caring BABYs. Of course, we do not “tell” anyone to follow our “Ideal BABY guide”, but if people who agree with it share it a lot, we’re sure it can influence many people. A BIG thank you to our partners for their help in spreading the word! I know that B.A.P need their privacy and deserve some moments for rest. That is why I encourage people to not follow them around during their free time or to their hotel/dorm. I respect B.A.P's personal space: When I am close to members, I do not grab them or touch them, since I know I would feel awkward if a stranger grabbed me or hugged me. I remember that B.A.P are normal people and have their personal space like everyone else. If I meet them at airport or other public places, I of course am excited, but I try to stay composed and not have inappropriate behaviors such as: run after them, scream their names constantly, insist for a photo/autograph or throw gifts at them (since they receive so many plus have to carry their own bags!). I know that B.A.P will smile/wave more at me if I have appropriate manners. Also, in concerts, I don't throw objects on stage since I know it would annoy them ^^. When I'm lucky enough to take pictures of B.A.P, I try to stay at a decent distance from them in order to let them walk in peace and not feel surrounded by many cameras too close of their faces. I not only cheer for my boys, but I am also respectful of other BABYs at concerts & events, not blocking views with fan boards or lightsticks, helping anyone who looks ill or in distress and never push or fight at events. I keep in mind that B.A.P are idols so they can't really refuse fanservices even if they don't feel well/are not in a good mood, so I of course do not initiate any kind of interactions since I want to respect their OWN decisions. I think that spreading baseless rumors or participating in fan wars is bad for both B.A.P's reputation and our fandom's reputation, so I try avoiding these situations. I do not believe everything I read about B.A.P on the Internet, unless it's from an official site or trusted source. For example: baseless rumours about individual members, and I do not overreact when I see something negative about them online if it's something that has no basis in fact. I am always respectful to the members when I mention them on Twitter or Instagram because I remember that B.A.P do read their mentions and can be hurt if they see inappropriate or rude comments. I not only respect B.A.P, but also my fellow BABYs. If I disagree with someone's opinion or behavior, I say so without being disrespectful, I avoid threats and bullying and I ignore irrational hate. If you pledge to become B.A.P's Ideal Baby, please comment your NAME and COUNTRY below. Then all you have to do is to continue being the awesome fan you are and encourage others to be like you! Country : United States of America .